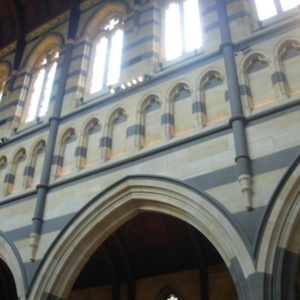 St Paul’s Anglican Cathedral is in Melbourne’s CBD. It was designed by English architect William Butterfield (1814-1900) and was consecrated in 1891, the foundation stone having been laid in 1880. The sandstone church was built in the Gothic Transitional style and the interior features arcading created by columns supporting pointed flying arches, lancet windows with tracery, stained glass, and blind arcading. 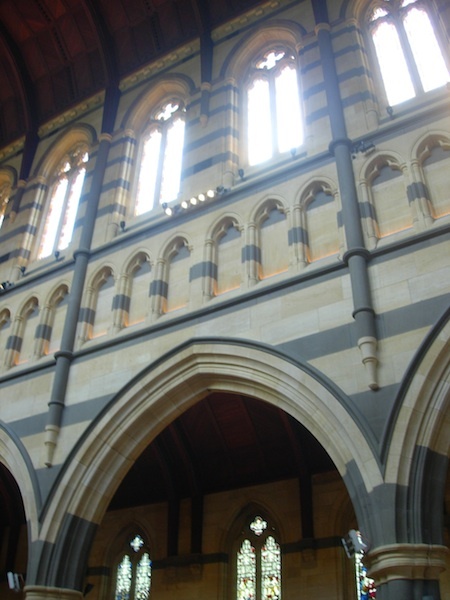 “Saint Paul’s Cathedral interior, Melbourne, Victoria,” Medievalism in Australian Cultural Memory, accessed April 23, 2019, http://ausmed.arts.uwa.edu.au/items/show/1309.